Longest lasting, most pristine and fresh sounding strings for a performing, professional musician found today. I'm long in the tooth and polished at finger style. Buy these from these folks now and realize that dream. I own a Schoenberg Soloist guitar. Very light construction--about as close as you can get to classical guitar tonal qualities in a steel string acoustic. D Angelico brasswound was the perfect string for this guitar. When they discontinued manufacture of these, I searched high and low for a replacement. John Pearse was best. Bright, even response across all six stings. My only complaint is they don't seem to hold their ring as long as I remember D Angelico's. From the first strum you hear they are different. On my solid wood Martin it was immediate. Clarity without all the shine. No first strum bronze jingle jangle. Had them on for about 20 hours now and they are holding on to this really great resonance. I've tried the John Pearce 600L Phospor Bronze, but they have gone from this guitar to the smaller Taylor Grand Auditorium, as those strings boom! Don't question this purchase- especially if your looking for articulation and response. I have heard of John Pearse strings for a couple of decades but never tried them. I have a holy grail of a custom guitar and always was satisfied with whatever strings I used, though I have tried many on it including D'Addario, GHS, Martin and Elixir Nano. They all sounded great. 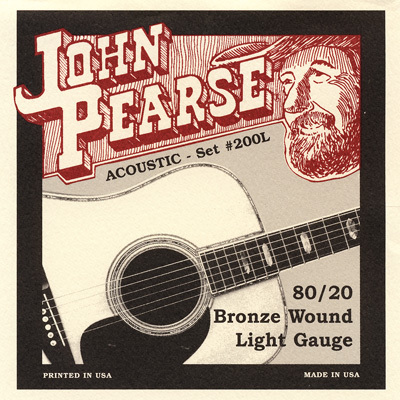 But I just tried a set of John Pearse 80/20 lights given to me by a friend to try. Wow. It turned my guitar into a grand piano. As great as the bass tones had been they gained magic with these strings. As great as the trebles had been they are now even fatter and more bell like. An incredibly superior string from my perspective. I just ordered ten more sets from Strings By Mail.